Dioceses of San Sebastián an Bilbao, Biscay & Gipuzkoa, Basque Kintra, Militar Ordinariate o the Philippines, Society o Jesus, sodgers, Eddicators an Eddication. Ignatius o Loyola (Basque: Ignazio Loiolakoa, Spaingie: Ignacio de Loyola) (c. October 23, 1491 – Julie 31, 1556) wis a Spaingie knicht frae a local Basque noble faimily, hermit, priest syne 1537, an theologian, who foondit the Society o Jesus Christ (Jesuits) an, on 19 Aprile 1541, acame its first Superior General. ↑ Idígoras Tellechea, José Ignacio (1994). "When was he born? His nurse's account". 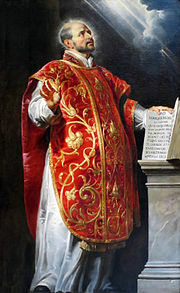 Ignatius of Loyola: The Pilgrim Saint. Chicago: Loyola University Press. p. 45. ISBN 0-8294-0779-0. This page wis last eeditit on 7 September 2017, at 21:45.